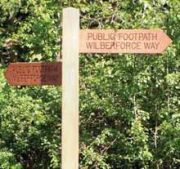 The Wilberforce Way is a 60 mile linear trail devised to mark the bicentenary of the 1807 Act of Parliament abolishing British involvement in the Transatlantic Slave Trade. The trail starts in Hull (where William Wilberforce was born), goes through Pocklington (where he went to school) and finishes in York (where he was declared M.P. for the County of Yorkshire). The trail is divided into 13 inter-connected walks so the route can be completed as a series of short day walks. As well as visiting places of special importance in the struggle for human freedom and dignity, the walks include places of more general interest and some delightful Woldian landscapes. Visiting places of Christian worship along its route, the Wilberforce Way can also be used as a pilgrimage walk.